I normally don't write reviews so quickly, but i wanted to mention that I confirmed with a Jenson employee that this is not PF30 (the description, as of this review post date, is incorrect), but BB92. This fits my 2014 Giant Trance 27.5 frame perfectly, for anyone else wondering. Spins smoothly and no creaks on the test ride. Longevity is obviously TBD. Nice combo with my 2x XT Crank. Very smooth! Very Happy with my purchase. easy fit on a Devinci Spartan. Great value for the cost. A new frame set finally forced me to go with a press fit bottom bracket. This one installed easily, doesn't creak, and is super smooth. Decided to switch over to a Shimano crank on my Commencal Meta. Was getting tired of blowing up the tiny PF41 bearings on the original 30mm crank. Literally took 1 minute to install with a simple press and just does it's job. Simple, cheap, easy... not much else you can ask for. Bottom Brackets are wear items and should be replaced annually. The MT800 makes it reasonable to do so. At 13.99, its a no brainer. Jenson Customer service helped me choose the right replacement since mine was outdated and replacedwith new #'s. They actually recommended the cheaper of the two possibilities for this press fit BB. 5 stars for both the product and customer service. Living in CA I can usually get 18 months or a little more out of one of these. For the money it is impossible to beat. The tolerances on my Pivot are very tight so I have have never had a problem with creaking. As with any press fit part, correct installation is key to trouble free use. Always fast delivery and great communications from Jenson USA. Simple, but does its job well. For this kind of BB, I don't know why you would need anything more expensive. After some frustrating and disappointing experiences with PF30 cups being walked out and creaking, on my Spec Enduro 29 frame, I'm happy to report that the PF92 on my Ripley and RM Thunderbolt are solid... no more will I group PF92 with PF30 when cursing the existence of PF BBs. Shimano has a plastic shim that adds more sealing and prevents another case of metal-on-metal friction fit, between the crank spindle and bearings. Good stuff! Buy with confidence. Works fine. Cheap enough to replace now and again. What else are you going to say? budget friendly and is working so far after 100 miles. Apparently these are disposable, because my last one burned out after one year of use. I probably rode 500 miles on it. I've never had a bottom bracked fail in under 5,000 miles (external hollowtech and square taper, NOT press-fit) so these press-fit ones are obviously designed for extremely short life span relative to what I'm used to. Price was good, at least. Not too much for a burner part, and my frame will pretty much only fit this or a couple of other (supposedly longer lasting) but much more expensive types. Gets the job done but doesn't last long. Fairly cheap plastic part with small bearings. I usually go through at least 2 in a season, but still can't bring myself to pony up for a "high end" bb::). BEST ANSWER: Does this bottom bracket work with the older Shimano XT cranks (hollow tech)? I have a 2017 Norco Optic C9.1, what do i need to switch to shimano crank arms? BEST ANSWER: Congrats on owning the best MTB brand in the universe. I have a 2017 Revolver FS and it takes a a PF BB92 and so does you Optic. I assume you're using a Shimano Hollowtech crank, so you'll need a press fit 92 mm bottom bracket, BB-MT800. You can pretty much use any press fit bottom bracket designed for a 92mm bottom bracket width and 24mm Shimano Hollowtech crankshaft. The optic 2017 has bb92 so this works. Can this be used as a BB-MT500-PA replacement? BEST ANSWER: Yes. It should be a direct repacement. I have a SM BB 70 bottom bracket on my bike...is the BB MT800 compatible ? BEST ANSWER: I did not use the bottom bracket I purchased for your questioned application, but in looking around on the net it appears that the MT800 will easily replace the older BB70 version - just make sure you match the inner bearing inner diameter to your current crankset shaft outer diameter so the parts fit correctly. Hello, if the model is the same as the photo that is next to the question "BB-MT800-PA" (pressfit) it is not suitable for use in threaded frames. If your frame model is threaded, the "BB-MT800", is ok. I hope I have helped. No. 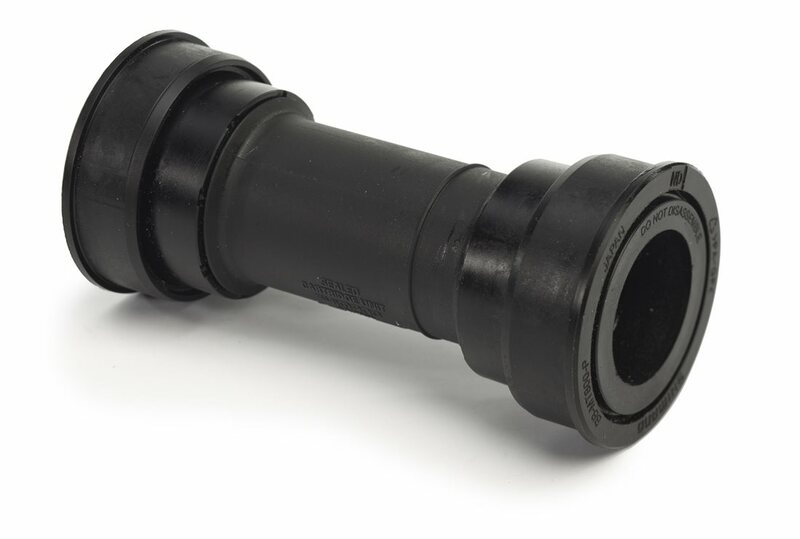 The SM BB70 is a threaded bottom bracket while the MT800 is a press fit bottom bracket, ie no threads. will this fit on a 90mm bb press-fit shell (2014 Xprezo wuuu)? BEST ANSWER: Yes it will but you might have to use a 1.5mm spacer on the drive side if the non drive crank arm doesn't tighten in to preload the left side bearing, when using a Shimano xt crankset. Hi, does this part fit a Marlin 5 with a 73mm bottom bracket? BEST ANSWER: This bottom bracket most likely will NOT fit 73 mm. The box says 89.5/92mm. The bike I put it on has a 92mm bottom bracket. Almost definitely not. Pretty sure the Trek Marlin has a traditional threaded bottom bracket. This one is a press-fit. BEST ANSWER: Yes it will fit your bike. Got a 2012 Giant reign will this fit? What tools are needed to remove and install this? BEST ANSWER: You'll need a bottom bracket remover, sold by Park Tools, or Pedros to get it out, and a press to put it back in. A hand held, or home made press will easily do the install. I have a Specialized Stumpjump comp 2012, diameter 46mm and 73mm witdh. This BB works? BEST ANSWER: Looks like that frame has a PF30 bottom bracket. If you're looking to run Shimano cranks your best bet is a pressfit to threaded adaptor with a threaded bottom bracket. I have attached both. BEST ANSWER: From the specs chart i found on your bike it shows that it uses a BB92, so it should fit. Can this be used on a 2016 BMC Speedfox 02-XT ? will this work with a 2016 BMC Speedfox 02 - XT? Would this be the appropriate BB to go with a 2017 Kona Hei Hei Trail supreme using my existing XT 1X boost crankset?